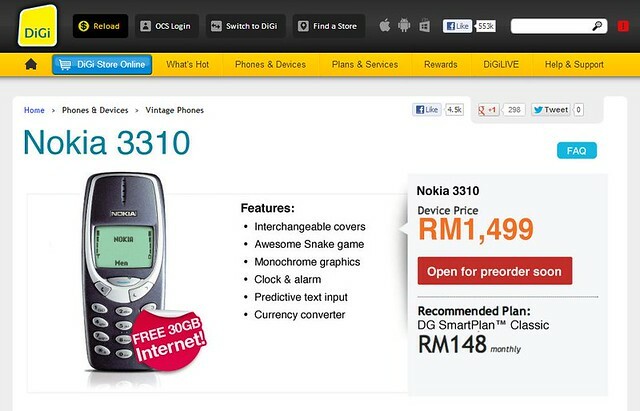 It would definitely be a crazy idea to sell a vintage phone for a tidy sum of RM 1499.00, but that is exactly what Digi did. The phones were definitely NOT going for a song, but I had to choose word that rhymed with the rest of the title. With April Fool’s day lurking just around the corner, I just couldn’t help glancing at Digi’s latest ‘offerings’ with suspicions. I’m not sure if the company has done this before, but it seems that the folks at Digi are not without a sense of humor. The first device that caught my eye was the ever-venerable Nokia 3310, which was what Nokia made they married a tank with a microchip (it was tough and state-of-the-art at the time). The phones definitely have their selling points, chiefly being the toughness of the devices, and in their own words, with one model even sporting a ‘super thick’ antenna. Who needs to carry a weapon when you can just use your phone in self-defense? Another selling point? Check. Real buttons you can press (wow! Long time no see!). Looks cool when you answer phones (and I thought only BlackBerry users were dinosaurs). Also, Digi is being such a darling for throwing in a whopping 30GB of Internet for the devices. Internet done right? Maybe, except that it may take till the next Ice Age to spend all 30 gigabytes of the allotted quota, which is hardly surprising since, you know, the phones come equipped ultra-modern WAP browsers. Not.